Heat oven to 450°F. Make pie crust as directed on box for One-Crust Baked Shell, using 9-inch glass pie plate. Reduce oven temperature to 350°F. In 2-quart saucepan, heat pineapple, sour cream, granulated sugar and flour over medium heat, stirring constantly, until boiling and thickened. Reduce heat to medium-low. In medium bowl, place egg yolks. Slowly stir 1 cup hot pineapple mixture into egg yolks. Stir this mixture back into remaining pineapple mixture in saucepan. Heat to boiling over medium heat, stirring constantly. Stir in rum extract. Pour hot filling into baked pie shell. To make meringue topping, in large bowl, beat egg whites, vanilla and cream of tartar with electric mixer on medium speed until soft peaks form. Slowly add powdered sugar, 1 tablespoon at a time, beating on high speed, until mixture forms stiff glossy peaks. 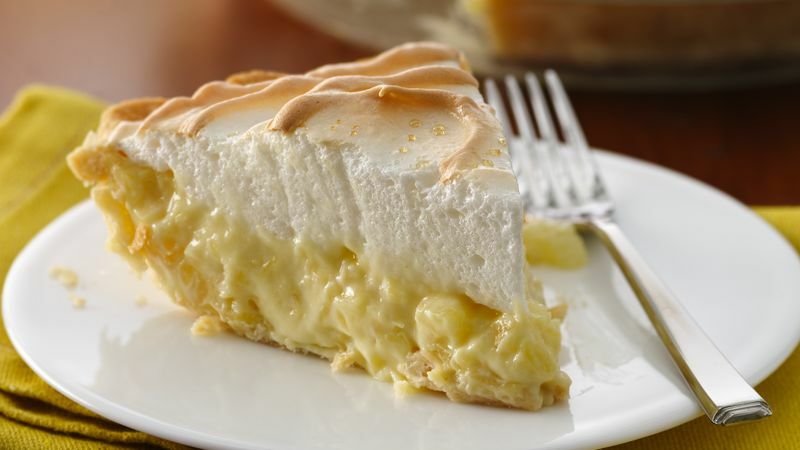 Immediately spread meringue onto hot filling, spreading to the pastry edge. Bake 12 to 15 minutes or until golden brown. Cool on cooling rack 1 hour. Refrigerate 3 hours before serving. Cover and refrigerate any remaining pie.